A basic home accounts program which allows you to keep a record of credits and debits to a single account. Although each account is individual (eg. current account, credit card, building society etc. ), from version 1.10 these accounts can now be linked, so making an entry in one account can be transferred to another without needing to have the second account loaded. Also, from v 1.13 the sub-accounts facility has been greatly extended so that links between different virtual accounts are more flexible. Direct debits, standing orders and other transfers can be automatically entered each month. Transactions which have been checked against your bank statement can be marked to keep a "statement balance". Account records can be sorted quickly by date, details, category, credit or debit amounts. Individual account files can be password protected so they can only be loaded if the correct password is currently in place. The application is being developed continuously. Sorting of transactions Automatic entry of transfers and direct debits etc. When entering transactions into the an account2 window, please remember to press <RETURN> after each entry. You can enter and edit transactions in either the main account window or a sub-account window. It is not a good idea to have a sub-account window open, enter a transaction into the main account window and then enter another one into the open sub-account window. Open sub-account windows are not automatically updated when a change is made in the main window, so there is a danger that you will overwrite a transaction. Clears account in memory and resets. Bin to delete an unwanted transaction. See 6. Opens a directory for saving and loading your accounts. QUICK method - This method only lets you enter the day and month. The year is automatically entered as the current year. Click <select> in the date column. The exsisting date will delete. The format for entry can then be dd/mm or d/m (or d/mm or dd/m!). If the day number and month number are the same, you only need enter the number once (How easy is that!). Separators can also be <space> or - (minus sign). FULL method - This is needed if you want to enter a year other than the current one. Click <adjust> in the date column. This time the existing date will not delete so you can edit the date shown. The format for entry can either be dd<space>mm<space>yyyy, dd/mm/yyyy or dd-mm-yyyy, but must be entered in full (ie. not d/m/yyyy). The program will not let you enter a day number higher than 31, but has not been designed to trap dates such as 31st February. That's up to you! If you enter transactions with a date which has not yet arrived (postdated), you can either choose to include these in the present balance, or wait until the transaction date arrives, when the account balance will be automatically adjusted. This is selected from the iconbar menu "Choices". The default is not to include them. You can also set an alarm to warn you (when you load an account) that a postdated entry has reached its inclusion date and the account balance has been adjusted. The Postdate exclusion and alarm are useful for reminding yourself to pay a bill on a certain date. This is a very useful function when checking your account against your bank statements. As each entry is checked, mark it by clicking [ADJUST] in the Details column. The details should now be shaded and the transaction will be added to the statement total. Delete the mark in the same manner. To perform any of these operations, firstly select the transaction by double-clicking [SELECT] in the Details column. If you want to select more than one transaction, hold down the SHIFT key and click [SELECT] over the last transaction you want to select. You can select up to 20 rows. Most of the row will invert in colour (not the details column because this is used as described above). Once a selection is made, the "selected" option in the main menu becomes available and you can delete the transactions or copy them for pasting elsewhere. The paste option becomes available once a transaction has been copied. To paste the copied transactions, simply click in the details column at the point where you wish to place it, and select [MENU] >selected >paste. The usual RiscOS conventions - Ctrl X, Ctrl C and Ctrl V allow you to perform these operations from the keyboard. A "move" option is not available, since chronological date sorting is available. 6a) Copying transactions to a different account. From v1.09 accounts can be sorted by category, transactions details, debits and credits as well as by date order. To do any of these, place the cursor over a blue column header (eg."Details"). The cursor will change shape to a "sort" pointer and clicking this will sort the account by the header. The SORT icon on the toolbar still sorts by date order. This useful function means you never have to remember to enter any transaction which occurs each week, every two weeks or up to four times each month. Select [MENU] > Direct debits. This brings up a table of the direct debit transfers that you have in place. To look at one in more detail or to edit one, click anywhere over the row of the one you want to edit. This will open a new window with detailed information about the transfer. To create a new direct debit transfer, select the "Add New" icon at the top of the "Direct Debit Information" window. I will now explain how to set up a new direct debit in the "Direct Debit set up" window. Enter 5 in the first box of "dates each month". If you wanted to make a second transfer on another day in the same month, add it in one of the other boxes. If the frequency you want is every week (or every two weeks), click the appropriate button and enter the day number of the first transfer in "start date". start month - This is initially set to 1, and means that transfers will start in January. If you want the first transfer to be some other month then enter the month number in the box. Enter an end month to stop monthly transfers (the last transfer will take place on the exact date made up from "dates each month" and "end month"). Enter an end date and end month to stop weekly transfers. (the last transfer will take place on the first appropriate date after that made up from "end date" and "end month"). Amount - What should be deducted from your account each month. If the amount is preceded by a minus sign the amount will be credited to your account. Category - Click these icons to see the category menu (if you have created some categories). From: Transfers will be marked with the category you select. To: Use this to make an "internal" transfer (from one category to another). Suppose you select category "a" in the From: field and category "b" in the To: field and enter £20 in the amount field. The master account will then show a debit of £20 marked with category "a", and show a credit of £20 marked with category "b". These will both have the same date stamp. Save - This adds the new (or edited) transfer to the direct debit list. Transactions should then appear at the correct time each month. Any transactions which have already passed the date for inclusion will appear immediately. Cancel - leaves the Direct Debit set up window without making changes. Note that you can refresh all transfers by selecting - [MENU] > Refresh all - when over the Direct Debit Information window. Delete - This will delete the direct debit from the transfers table. Check that the message box asks you to confirm your decision. Editing a transfer is pretty much like creating one, except that you are only able to alter the details, amount and categories. If you want to alter the frequency or start or end dates of the transfer, it will be necessary to create a new one and delete the old one. GENERAL POINTS - In the Direct Debit Information window, the Day of Month column either shows the day of transfer of a monthly direct debit, or the first of the four if you have chosen more than one, or the frequency (7 days or 14 days) if the transfer is not monthly (this number is shown in red). Each transaction you enter can be given a category which marks it with the transaction type (eg. Salary, Food purchase, Insurance). You define these in [MENU] > Categories. There are 20 Master Categories with each one having 9 sub-categories. You can define each one as you wish. Click [OK] when you have finished entering categories and !Account2 will then make a menu of these categories which can be used as described below. When you have entered some categories, you can mark transactions by clicking [SELECT] in the yellow 3rd column. A menu will pop up, and simply select the category you want. The last selection in the menu ("none") deletes any category mark. You can also do this by clicking [ADJUST] over the 3rd column. It is possible to SAVE and LOAD category data so that it can be passed from one account to another (for example, at the start of a new year or any other new account). When in the category window - [MENU] > LOAD category and SAVE category act upon the category file in "<account2$DIR>.files.category". One purpose of defining categories is to allow you to create a report of how much you spend or earn in each category. Selecting [MENU] > Sub-account (or clicking the graph-like icon at the top of the main window) opens the report (or Sub-Account) window. There is an option to convert credits into debits (and vice-versa) so that the sub-accounts appear credited when the master account is debited. 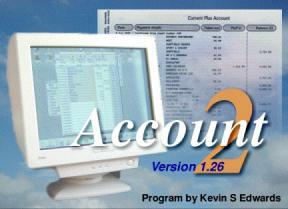 !Account2 started life as a single account facility, which was all I required of it. Feedback from users has shown that they would like to be able to make linked tranfers between different accounts, and I have tried to implement this option in a couple of different ways. One way from v 1.10 is by linking accounts ie. separate files which can pass data to each other. However, from v.1.13 the flexibility of the sub-account usage is much improved, almost to the point where you could treat sub-accounts as seperate accounts under a common master account. Which system you use would depend on your preference and needs. Try out both systems and see. To give you an idea of how linking transfers between sub-accounts might work (compared with linking account files) try this example. It shows how records of a credit card and current account could be linked. Select [MENU] categories and create a "current account" category and a "credit card" category. Open the credit card sub-account and enter some purchases- say, £20 ,£30 ,£40 in the debit column. Open the credit card sub-account. Enter the total - £90 in the credit column. In the Category column of the credit card sub-account window select current account. Once you have entered this you need to make at least one more entry to that row (details or date) and on doing this you will notice that the letter code for the current account dissappears. This is to let you know that the transfer has taken place, and to stop you doing it again by accident. If you open the current account sub-account you will see that a debit of £90 has been made and the balance is £1910.00. If you now check the main account window you will see the transactions and linked tranfers entered with the correct category codes, and the balance of the account is £1910.00. Date entry can be either quick or full (as in main account window). If you click on the account name (over the Details column) the category menu is displayed and you can select a different sub-account for editing etc. Sorting, deleting and copying transactions cannot be done from the sub-account window. You need to do this from the main account window. Existing Account2 files can be loaded by clicking on the file if the program has been "seen" by the filer, or by dragging files to an Account2 window or iconbar icon. If you intend to use one main account file throughout the year, the red Account2 "pound" icon at the top of the main window gives a quick way to load this (or whatever the last file you saved was). This is initially set to load the help file, but will change when you save a file. Select [MENU] > Export. Set the choices according to the program you are exporting to. In quotes - Quotation marks can be placed around each data cell. This is useful if any of your transaction details include a comma. Include balance - If deselected, this prevents the balance of each row from being exported. If exporting to a spreadsheet, you may want the speadsheet to do this calculation. Include row number - Exports each row number. Useful for creating a more unique record in a database. Separator - This can be set to a comma, a carriage return or a Tab. Date divider - Some programs will only accept date information in a specific format. You can choose a space, a forward slash (/) or a dash (minus sign -). Enter a CSV file name and drag the file icon to a suitable directory. CSV file import is not available. If there is already an account loaded, the imported file will be added to the end of it. The file being loaded must have only four fields - Date, Details, Debits, Credits. Year number non, y, yy or yyyy. If no year is present Account2 assumes the current year. If only 2 digits are present Account2 assumes 20th century from 40 onwards (ie. 40 gives 1940) and 21st century upto 39 (ie. 39 gives 2039). The American date system - mm/dd/yyyy can be set as default by selecting Choices from the iconbar menu. If dd/mm/yyyy is set as default Account2 will change to mm/dd/yyyy when importing if a month number greater than 12 is encountered. You will be warned that this has happened after importing, along with the row number where the change occured. If the imported file is made up of a mixed selection of dd/mm/yyyy and mm/dd/yyyy, your on your own in sorting it out after import! Select [Menu] >Print, click the Printer icon in the main window or press the PRINT key to print from the main account. Click the Printer icon in the sub-account window to print a sub-account. If you have a suitable printer driver loaded this will be named in the new window. Select the number of copies you require. If you are printing from the main account window, you also need to set "Print All" or enter the actual range of row numbers you wish to print. (Row numbers are shown next to the file name in the main window). If you are printing from a sub-account these will be ignored. If you select "Print All", the row numbers will be ignored. If you enter a "To" number higher than the total number of rows, printing will end with the last transaction. From version 1.10 it is now possible to transfer transactions from the account being edited to another account by linking the two accounts together. For example, suppose you keep a credit card account (called "card") and a current account ("current"). You decide to pay off some of your credit card transactions using funds in your current account. To record this in both accounts at once, load the "card" account into !Account2 and drag the "current" account icon (from the "files" directory) to the small window top right. Enter the repayment into your "card" account in the normal way as a credit (since you are crediting the card account). Select the transaction you have made by double-clicking over the details column (as you would for copying, deleting etc. ), and click over the name in the linking window ("current"). This will send the transaction to the "current" account file and enter it as a debit. From version 1.11, multiple transactions (up to 20) can be transferred. If you want to send a transaction to a linked file on the same accounting side (ie. a credit is sent as a credit), open the sub-account window and switch off the "Convert Debits/Credits" option. To break the link between account files, un-tick the box next to the linking window. The file name will disappear and the link will be broken. Just drag any !Account2 file back to this window to link it with the account you are editing. Before you can link any files which you have already begun on an earlier version of !Account2, you need to make sure the files have been loaded into and saved from v.1.19 (or later) at least once. This is because v.1.19 uses a slightly different file format from earlier versions. You can create a table of abbreviations to make it easier to write details which you enter frequently. Click on the abbreviation table icon at the top of the main window, or select [MENU] > Abreviations. Enter your abbreviation (eg. am) in the "Abr." column enter (up to five characters) and what it stands for (eg. Amazon.co.uk) in the "Replace with - " column. Click OK to store the abbreviations for the session, and SAVE to store them for future use in Account2. Then, instead of entering the full description in the DETAILS column, you only need enter the abbreviated code for the details. There is space for 40 abbreviations. These are stored in "<account2$DIR>.resources" and therefor apply to all files. Entries to the debit and credit fields can be the result of a calculation if you wish. To do this, make sure the cursor is in a debit or credit column, and either click [ADJUST] over the field, or click on the calculator icon at the top of the main window. When the calculator window opens, enter your calculation and click OK (or press RETURN). Operators +,-,/,* and brackets can be included. I like to start a new account each year in January. Before this current version 1.14 I have had to manually carry over transactions which have not been seen on a statement, create a new BALANCE BROUGHT FORWARD, and refresh all direct debit transfers. This was tedious. Now you can select [MENU] > New Year - and Account2 will do all this for you. Only transactions which have not been added to the statement balance will be saved, and the statement balance will be carried over as BALANCE BROUGHT FORWARD. This leaves you with the same balance. You are also asked if you wish to refresh all direct debits. Beware of any transfers which did not run from the beginning of the last year. You would presumably want this to continue without break, so if you have any transfers like this you need to reset them individually in the Direct Debit set up window. This facility allows you to select any date before the end of the year, and get a forecast of your balance on that date (for making sure you have sufficient funds in the account etc.). It is based on either direct debit transfers and postdated entries which will have been included in your balance by the date you select, or on average daily spending. Click on the crystal ball icon (next to NEW) and enter the day and month of the forecast date. You will then get a projected balance for that date. From version 1.20 it is possible to set category budgets and be warned if you exceed the budgeted amount. Any entry in the DETAILS field can be globally changed by selecting [MENU] >Search and replace. Enter the word, words or part word that you want to change in the find box, and its replacement in the Replace with box and click Go. 19) Known bugs and idiosyncrasies. The direct debits "Day of month" entry is not checked for validity. If a transfer normally takes place on the 30th of a month, this will still appear as 30 even in February. I leave the user to enter sensible values. The program is freeware and can be used and copied at will, providing that the program is not altered, and is only distributed in an official version condition. This program is supplied "as is". No warranty, express or implied, of the merchantability of this program or its fitness for any particular purpose is given. In no circumstances shall the author, or any provider or distributor of this program, be liable for any damage, loss of profits, or any indirect or consequential loss arising out of the use of this program. Thanks especially to Andrew Ayre and Ray Favre for making programming a joy(!) with Dr Wimp, and to Martin Avison for the extremely useful sorting program ArmSort used in versions from 1.09 onwards.